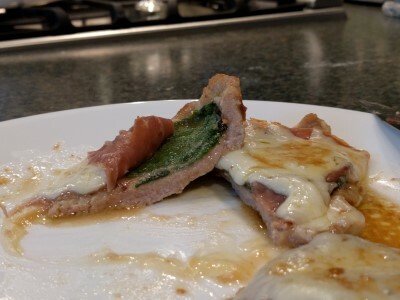 A few weeks ago I posted about the Chicken Saltimbocca we made from Mario Batali's Farm To Table cookbook. Last August, we made a Veal Saltimbocca from Sara Moulton. Her recipe is Sara's Veal Scallopini. Making saltimbocca is pretty simple, it's just that there are a few steps. Pound the veal, dredge n flour, and saute. We had giant sage leaves last year. We were surprised how huge the sage leaves grew. Grate fontina. Her recipe says slices but we grated our block of fontina. 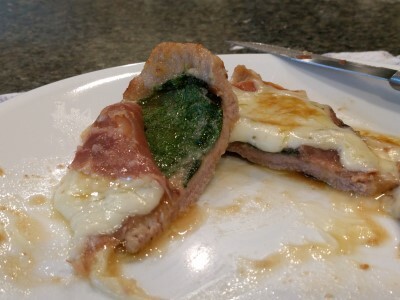 In a casserole dish, top each veal vutlet with sage, then prosciutto, then fontina. Make a pan sauce with marsala and chicken stock then pour it over the cutlets in the casserole. Bake at 400, covered, for about 10 minutes. Crispy veal topped with ooey, gooey cheese. Under all the cheesy deliciousness is the salty prosciutto and the sage. This was a yummy treat. We don't eat veal very often, only when SP finds the "happy" local veal. It's worth the effort of several, easy steps. Definitely a make again treat.